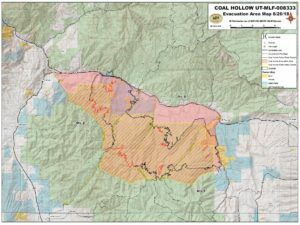 After reevaluation of the #CoalHollowFire perimeter, the incident management team, in conjunction with Utah County Emergency Management, the Manti-La Sal National Forest, BLM and DNR are set to reduce the closure and evacuation footprint around the fire at 0600AM tomorrow, Sunday, 26 August 2018. The forest and surrounding burn areas will remain closed between Lake Fork Road on the western boundary to the west side Of Starvation Road on the eastern boundary; and from HWY 6 south to East Lake Fork Canyon on the west and Bennion Creek Drainage/Spring Canyon to the east. Skyline Drive from HWY 6 south to the juncture of Bear Ridge Road and Lake Fork Road remain closed. At 0600AM, Sunday, 26 August 2018, the area west of Lake Fork Road to include Blind Canyon Road/#0126 and Dry Canyon Road/#0214 will be open. The area south of East Lake Fork Canyon over to South Bennion Creek Drainage/Spring Canyon and east of Lake Fork Road will open. Starvation Road, Bear Ridge Road/#0008, Fish Creek Ridge Road/#0122 and Skyline road from the juncture of Bear Ridge Road, will open.